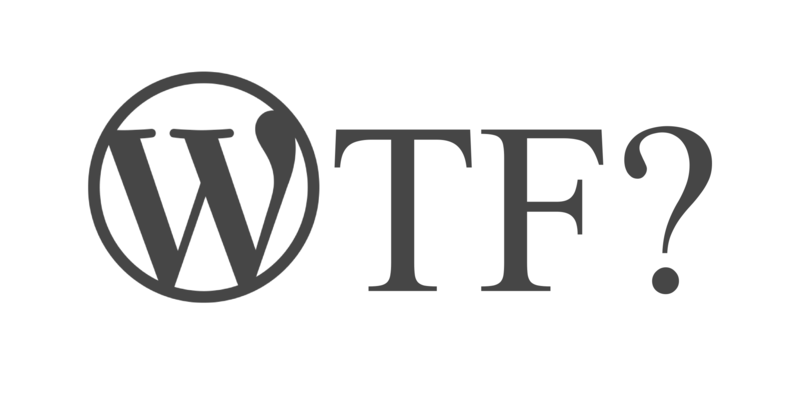 I finally figured out the one of the main things I don't like about WordPress, particularly in these times. I just took on a new client, a small business, which has a WordPress site. The job has more to do with search engine optimization and developing content marketing strategies than site building. Nevertheless, since I have developed Wordpress sites in the past, and since the site’s configuration does have an impact on SEO, I conducted an audit of the site’s plugins and currently active theme. And there they were: two premium plugins. The theme was also a premium theme. And of course, both premium plugins have updates. In order to download the updates, you have to have the license key, as well as the log in credentials to the plugin developer’s website. And who holds the license key and those login credentials? The nowhere-to-be-found previous site developer. This all has a greater sense of urgency due to the fact that one premium plugin is not working properly. It is used to create custom layouts within the text area of pages, so it is a key plugin for the site to display properly. A quick Google search discovered that the update was necessary in order to work properly with the latest versions WordPress. And yet, here we were, with no license key, and no log in credentials. As many who work with WordPress know, the last six or seven years has seen an explosion of growth in the number of premium themes and plugins. It didn't used to be this way. Back at the beginning of the open source content management system ("CMS") movement around 2000, up through around 2009 and 2010, a person building a website with WordPress used all open-source plugins and themes, which were subject to a liberal open source license. You might have had to pay a web professional to program the site for you, but in the event that your web professional quit or vanished from view, another web professional could come in and make changes. Then the trend of the premium theme and plugin emerged. These themes and plugins appealed to people who wanted to build a website, but had no idea how to code. All of a sudden hey! Do your own layouts and apply your own color scheme without using HTML or CSS! Whoopee! Now, many who did not have the aptitude and/or did not wish to learn HTML, CSS or PHP (the scripting language that makes a CMS a CMS), but wished to get into the website building business, had new tools at their disposal. However, there were limitations. No matter how hard you try with these premium themes and plugins, you cannot cover every potential configuration in the theme settings to meet every possible client request for layout or style modifications. Chances are if you asked your website designer for a feature, and they said to you, “that's not possible,” they were probably using premium tools to build your site, and couldn’t find the right switch to turn on, or the right button to push in the theme options settings. It is very common for the individual or firm building the website to purchase the license to those themes and plugins. Then there is the ultimate limitation. If you sever your relationship with that web professional, or if the web professional goes out of business, all the sudden you are stuck with the premium tools but not the license key for them. If you did not have those login credentials, then you cannot run the updates, and run the risk that your site will not operate properly in the future. Of course not all premium plugins and themes are bad, and not not all web professionals use premium tools because of their ignorance of development skills. The premium theme or Plugin can often be a good value and provide features that would otherwise cost much more to build from scratch. However, in the hands of individuals who are less than honest, who represent themselves as “web developers” and then turn around and buy a bunch of push-button tools without telling the client in an effort to appear to be more skilled than they are, who then do not transfer the license for these premium products to the site’s owner, websites built like this can cause problems for the unwary site owner down the road. Most often, the problem can be solved by having the website owner simply acquire a new license for those products. But the point is, he or she shouldn't have to. So What’s the False Promise? What I don't like is that too many people use these premium products, hide it from their clients, and then hold themselves out as website "developers." The word "developer" suggests a certain mastery of code. With Wordpress, it suggests a certain mastery of the Wordpress API as it is used inside theme templates, at the very least. Maybe even the ability to write a few simple plugins. If all you are doing is using a handful of premium plugins and themes, and know nothing about the Wordpress API, then you are not really a developer -- are you? There's another thing that bothers me. Websites are marketing tools. A site owner does not want a website; he or she wants the new business that the website can generate. As with all marketing, getting the website right to further that goal often requires subtlety and nuance. You may need to move the location of a call to action, or change it’s color. Any one of a dozen different factors can come into play at once. The suggestion that all this can be accomplished with a premium plugin or theme, by just pushing a few buttons, and without the help of a specialist to implement such a nuanced strategy, smacks of dishonesty to me. I should note in fairness that some in the Wordpress community recognize this is a problem, and have made calls to change the way their premium plugins are used. Take a moment to educate yourself on this process. When speaking with prospective web professionals about a new website, ask whether they will be using all open-source plugins and themes, or premium plugins and themes to build your website. Ask them if they are familiar and fluent in the Wordpress API (If they respond, "What's that?" you'd be best advised to end the conversation and speak with someone else). They should be forthcoming about this. You should include a clause in your agreement with that web professional that to the extent any and all licenses are required for premium website building tools, they should be transferred to you, the website owner, after the site is completed. Also emphasize that you don’t just want a website; you want new clients or customers to come in through the website. This way, you have the opportunity to maintain your website in the proper way going forward. Those who know me know that I prefer building websites in Drupal. This article, by Rich Lawson of Duo Consulting, is also worth a read. It mentions the problems with premium plugins, and other important issues in the Drupal v. Wordpress debate. Looking for ways your website can get more customers or clients? Contact me.